Will My Home Owner's Insurance Cover Damage By Wildlife ?? Some Insurance Companies may cover Bat Exclusin, since they (Bats) are not rodents. Most homeowners policies will not cover any rodent damage or removal, but since bats are not rodents, contacting your agent prior to an exclusion is suggested. 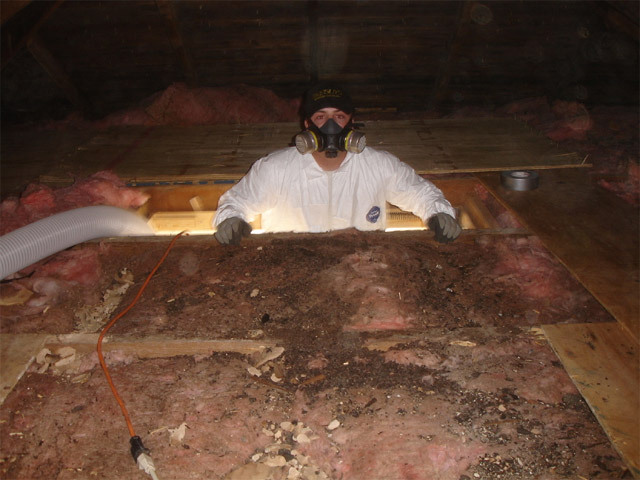 Oddly enough, we have found many insurance companies will not cover the exclusion cost, but will cover the guano removal and clean-up program. The good news is, insurance companies will often pay for some, if not all, of the costs incurred to get rid of bats. Also, damage incurred by raccoons or other wildlife may be covered, again contacting your agent prior to an exclusion and repair is suggested. If needed, we will provide a detailed estimate for your Agent. People know who to call when they see ants, cockroaches and termites crawling around, but many of these pest control professionals are not trained in wildlife damage management. The same maybe true of animal control officers, fire, police and others engaged in public safety professions. Wildlife control is best left to a professional. For their own safety, homeowners should not try to confront unwanted wildlife or attempt off-label use of household products, which is dangerous and may be illegal.